AS THOUSANDS of Coffs Coast residents take to the polls in glorious sunshine, Nationals candidate Gurmesh Singh has opened up on what he has described as a 'dirty' campaign from the opposition. 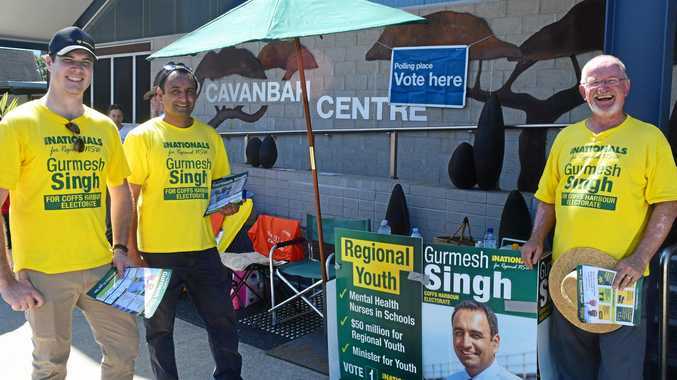 Whilst handing out flyers to round up some last minute votes at the Cavanbah Centre, Mr Singh said his first political push unfortunately turned personal. "It's been overwhelmingly positive from a public point of view, but the campaign has gotten a little dirty from the other side and we would have preferred it if they kept to the topics and the issues of the parties,” Mr Signh said. It's been a long campaign for Mr Singh, who was elected as The Nationals candidate in late November and has been on the go ever since. "Our work finished last night, we spent a lot of time campaigning very early on and made sure we did the right things on the ground. We walked up basically every street in Coffs Harbour. In what's expected to be a close vote count for the seat, the third generation farmer is just happy to have reached the finish line. Voting closes at 6pm tonight.